Sammy Watkins’s premature TD celebration in the Bills–Jets game seemed like the sure winner . 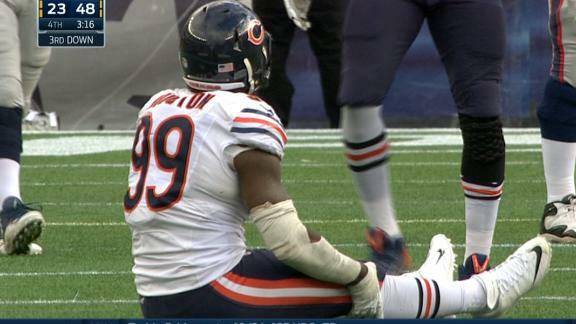 . . until a little later in the afternoon Lamarr Houston attempted to perform a sack dance with his Bears team down 25 points in the fourth quarter to the Patriots. Houston sacked Patriots backup Jimmy Garoppolo before setting the Week 8 standard for stupidity, skipping three steps before his right knee buckled upon landing. You could chastise Houston to act like he’s been there before but, at least in 2014, he hadn’t. Tellingly, it was the disappointing free agent pass rusher’s first sack of the year. We’ll soon know from a MRI scheduled for today whether Houston’s knee got blown out during the blowout.